New Wholesale Beanies! - CTS Wholesale LLC. CTS is now your source for awesome, wholesale beanies. A relatively new addition to the CTS merchandise line, our beanies are made of 100% polyester and are available by the dozen for only $24. This is a terrific price that breaks down to $2 per beanie. Prices like this will ensure you make a terrific profit on these. The assorted dozen(s) have been packaged to appeal to gender(s) and age group(s). For instance, there are collections that might appeal more to men with cool patterns in bold colors like red and black. 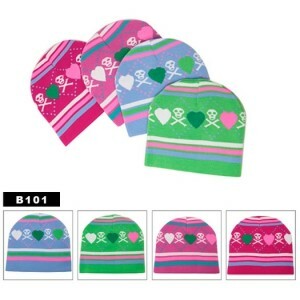 There are also attractive beanies that are more likely to appeal to ladies, in pinks and blues. CTS has also made available assorted dozen(s) that are non-gender specific as well, with great colors and designs that will be attractive to all ages and genders. Currently we are awaiting more beanies, at which time we will offer assorted dozens again. There are great beanies that little kids are going to love, and ones that adults will want to wear. There is a design for everyone! Everyone knows that a great way to keep warm on a cold winter day is to wear a stocking cap, and beanies are the more popular fashion choice these days. For this reason, beanies are a terrific gift idea, and will undoubtedly sell very well in a wide variety of locations. Locations such as convenience stores, fairs, flea markets, & gas stations all will do well to stock wholesale beanies. CTS is noted for their uncanny ability to provide the latest in fashionable sunglasses, and the new line of beanies will undoubtedly prove this to be true yet again. We've only stocked these for a short time, and the beanies are selling very well. Don't wait to get yours! These are going to go fast. Our selection of beanies is currently running low, but check back soon, we'll be ordering more!